Some people prefer playing old style slot games and some prefer modern style video slots that offer more winning chances. 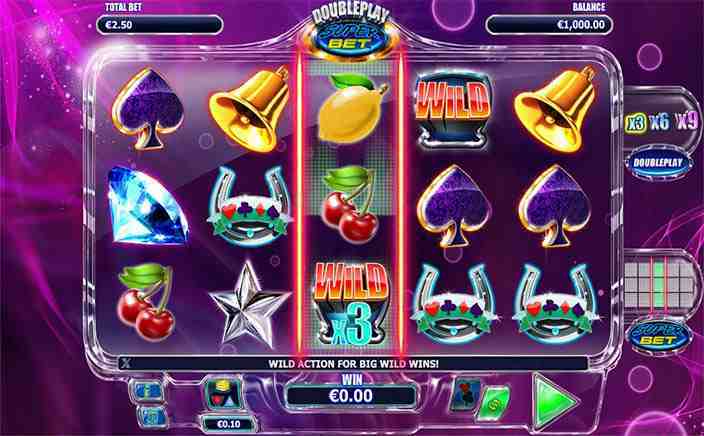 NextGen Gaming’s Double Play Superbet video slot is a great mix of traditional and modern style slot games. This game invites you to bet on a 5×3 reel and 25 payline slot machine that also features some bonus games like Double Play, Superbet and Free spins. The player can start betting at 25p and increase the betting amount as the game proceeds ahead. £225,000 is the maximum winning amount, which you can win by playing some big bets. By the way, the danger of losing more also increases when you play higher bets, but that’s what turns Double Play Superbet into a thrilling video slot. Double Play Superbet looks like a relaxing spot and the reels are set in front of that spot. Slot machine’s reels are transparent, which improve the aesthetics of the background. The main symbols seem quite similar to Vegas’ slot machines which are fruits like cherry, lemons, strawberries and plums along with a blue gem, a big red 7, a star, a bell, a spade, and horseshoe. The Red Wild plays as the wild symbol and game’s logo is the scatter symbol in this game. 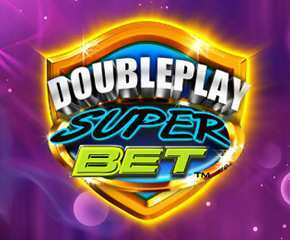 Double Play Superbet is undoubtedly an attractive video slot with beautiful visuals, and it also functions well on all devices including smartphones and tabs. The house edge ranges from 4.95% to 4.33% and slot volatility is high. You will have to play a minimum £0.25 bet to start gambling and you can increase it to £600 per spin. A lucky player can win £225,000 if he utilizes all the bonus features smartly. Double Play Superbet features two different modes of betting, first is the double play and another is the superbet. The buttons for setting double play or superbet options are shown at the right side of the slot machine. Players can get more multipliers by triggering this mode on. You can multiply your wins by winning in this round, which features 3x, 6x, and 9x multipliers. Also, you can also increase the bet amount by adding an equal credit of the initial bet. Therefore, £0.50 bet turns into £1.00 bet and so on. Without triggering the superbet mode, chances of landing wild symbol would be quite low. You can increase the chances of landing wilds by taping at superbet option. The wild symbol land on reel 2, 3 and 4 during the superbet mode and the bet size gets doubled with each spin. You can gain free spins by landing Double Play Superbet logo at least three times anywhere on the reels. It can reward you up to 15 free spins and also with an 18x multiplier. So, go ahead and try your luck on this double-trouble!